Hey blogosphere! I'm back again. See previous posts and past years for all universal excuses from departing this blog. I've been through them all. Wink. Accessories come in all shape and forms, nail polish is no exception. A badass boss color can reveal quite a lot, maybe even a hidden personality trait. Life, and business, should never be taken that seriously. Expressing your individuality is a part of your personal brand. And yes, everyone and anyone can have a personal brand, not just Sophia Amoruso. Nail coloring has become a large fashion statement for women, with colors that are totally outside the traditional light red, clear, and other muted palettes. 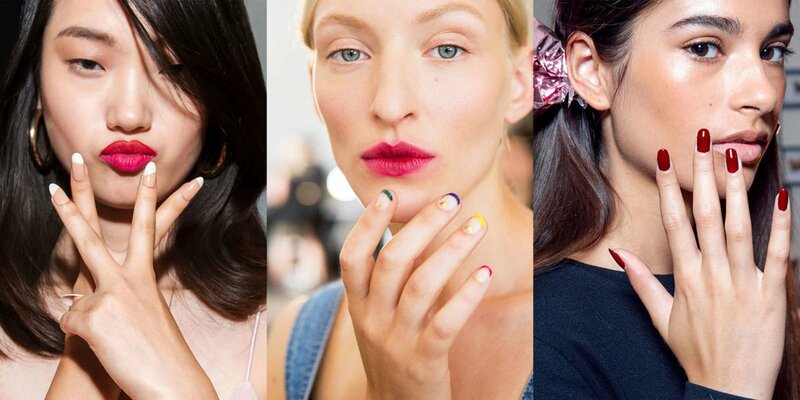 These days nail colors are bold, vibrant, artistic and everything in between. I should know, I recently tried metallic on my deep chocolate skin and went crazy from the novelty of it. I opted for matte silver, and though I will NEVER do it again, it was worth the experimentation. So for adventure-seeking demure girls like me, here are my editor picks for a daily palette that won't scare anyone away. You are sultry, seductive, and a glamour statement. Bold red is a nostalgia upgrade on the nails because traditional red was considered a vampish color and it was suppose to be muted. Today, red shows confidence, strength, and a controlled flirtiness. A woman wearing red does not shy away from the spotlight, plus she is showing off her much earned diva charm. A Femmeboss woman is daring, outgoing, and passionate in all that she does. Who wears “blue” on their nails in various shades? A woman who is both tranquil in her own mind, yet electric in her actions. Blue polish is indeed a great attention getter, showing personality traits of uniqueness, fun, and experimental. A woman wearing blue nails, thinks outside the box! Blue nail polish represents your personality that is youthful, fun, and you are willing to try new adventures. Orange is known to be a “cooling” color, as in the tangerine hue. Orange is an encompassing color, meaning that the woman enjoys being around people – she's a social butterfly. It is a tropical color that stands for creativity, love, and excitement. The bold woman wearing orange nail polish can make friends quickly, and without a doubt is the life of a party. Black as a nail polish - yes, it is powerful! Would you mess with a woman wearing black? Black nail polish for a daring enough style maven stands for a rebelling woman who is also a trendsetter. Black is dark, yes, but the female personality wearing this color is neither goth nor depressed, she goes against the norm and can be uniquely creative. Purple has always symbolized royalty and a color that is spiritual in its very nature. She is a natural beauty. Gem-colored nail wearers are embracing their higher power skills and mental enlightenment when they wear various shades of purple. Softer nail shades, like lavender or lilac, reflects a personality that is feminine, graceful, artistic, individualistic, and very creative.